Big Guys with Big Guns: My Take (What’s Yours?) | Barranquilla or Bust! To be fair, these guys are outside a small military installation (I’m told it’s a colonel’s home) a couple of blocks from our house. They were very friendly. Last week, my husband and I and our friend Scott took our usual Friday night trip to the movies at Barranquilla’s swanky Buenavista Mall. As is my routine, I stopped in the bathroom before the show. Coming out, I nearly ran slap into a big guy holding a really big gun – some kind of military-style assault rifle or semi-automatic type thing. (Can you tell how much I know about guns? It’s not much.) I jumped back, since this was not really what I expected in the middle of a nice multiplex movie theater in a very large, ultra-posh North American-style mall. I quickly realized that the movie theater offices were located near that particular bathroom, and that the guy with the gun was in the hallway probably because he and his partner were picking up or delivering a bunch of cash, á la Brinks in the U.S. This was nothing I hadn’t seen before in Colombia. This private security guard is protecting the burgers at El Corral – or more accurately, all the cars parked in the garage below. When my husband had to take several months of rent in cash from one bank in Barranquilla to another to put down the massive security deposit necessary to move into our apartment (that’s what happens when you have no credit history in the country you move to – see this Wall Street Journal article), the bank automatically outfitted him with armed guards for the walk down the street. Whenever an ATM is being re-stocked – invariably in the middle of the day when I need to get cash quickly – a guy with a very big gun stands outside the door until it’s done. Heck, I’ve gone in the Juan Valdez (like Starbucks, but with better coffee) when somebody awfully fancy must have been in there because big guys with big guns were posted outside each entry. At El Corral, a local burger joint, the security guard carries something that I prefer to think is an air rival or just plain fake (it kind of looks fake, right?). Even the church in our neighborhood had a big guy with a big gun posted outside the main entrance on Palm Sunday – a strange juxtaposition with all the dressed-up families entering to go to Mass. I am not all that freaked out by the sight of guns, but running into the guy at the movie theater did lead me to think a little more about what the visible and routine presence of guns in a society means. (I am not even going to try to deal with the issue of concealed weapons, though I realize the implications of those are probably even bigger. Honestly, if people are going to have guns, I’d rather that I can see them.) I don’t think there’s one answer to the question; to me, it’s pretty clearly a case of “it depends.” It depends on the community itself, the current circumstances and past history, who has the guns, etc. But regardless, the fact remains that a routine show of heavy weaponry has some pretty strong implications – implications that people in the U.S. and U.S. politicians would do well to consider given recent tragedies like Newtown (my chest tightens to even re-read the news coverage), the defeat of gun control legislation, and the NRA’s insistence that more guns are the solution. I realize, though, that my experience is not the same as others’ experience, and therefore my reaction to visible and routine displays of weaponry may not be everyone’s. 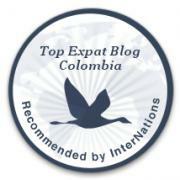 I am often aware that the experiences of the Colombians among whom I live are very different from my own. Colombians younger than I can recall a period of regular violence and daily insecurity that makes me shudder. I have been in a condo association meeting here where residents casually spoke of that time, several years back, when some guys came in to assassinate someone in one of the apartments (this type of entry to assassinate was distinguished from other types of forced entry). I have learned the Spanish words for being stabbed and being shot because I’ve heard them more times than I care to contemplate. And I am sure that even given what I have heard, much goes unsaid about that difficult and dangerous time. Fortunately, the years of extreme violence and insecurity – often referred to simply as “la violencia” (“the violence”) in Colombia – have passed. This recent CNN article, “10 Things to Know Before Visiting Colombia,” is right in stating that “drug culture stereotypes are false and offensive,” and that security in Colombia has improved by leaps and bounds. Honestly, I feel safer in my current neighborhood in Barranquilla than I did in the neighborhood where I lived in Miami. Three people I know were mugged at gunpoint in the latter. 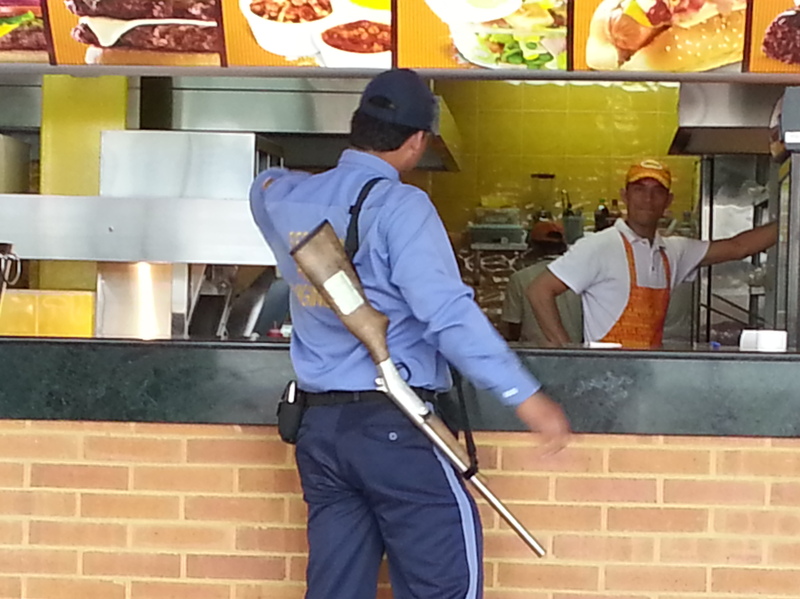 I’m grateful every day for the very acceptable level of security and safety that most of Colombia now enjoys. That being said, in contemplating the period of violence and this time of relative safety, it’s hard for me to know whether guns – undoubtedly part of the violence – were (and are?) also part of the transition to peace. It’s hard for me to know whether an average Colombian feels the same edginess that I do in seeing big guys with big guns, or whether he or she is instead comforted by knowing that the good guys have a level of control that they did not have before. I don’t know. I can tell you that I was glad the bank outfitted my husband with armed guards to walk that money a few blocks. There’s no question that sometimes it’s good to have power on your side. For Colombia, guys – good guys – with big guns are perhaps (I hope) a sign of a positive transition – a transition from violence to a new period of peace and prosperity. I’d argue that the transition will be complete when such displays are exceptional rather than routine, when it’s simply not necessary to display major weaponry on an ordinary day in order to assure security. 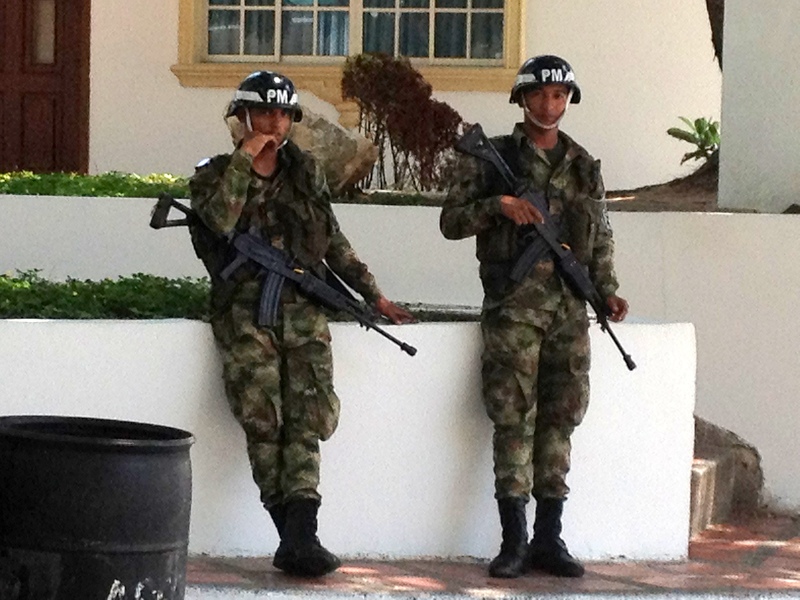 I’d like to live in a Colombia where we can go to church on Palm Sunday without the need for an armed guard outside, and I’m willing to bet that my neighbors would like that too. That’s the world I grew up in in the United States. It’s also the world that the U.S. now stands to lose. The United States can make the choice to fight guns with guns – to do things like arm teachers in order to defend against rogue attacks – but to my mind, it will be a sure sign that there is something that we have lost. It will be a sign that we are losing our safety and security, and with it, some of our peace and prosperity. As countries like Colombia move closer to becoming the safe and prosperous society that has long made the U.S. the envy of the world, Americans will be moving away. Maybe we in the U.S. have already reached a point where such a sacrifice is necessary, but I hope and pray that we have not. If we do begin that transition, we’d better know exactly what we’re transitioning toward. What is your experience with guns in daily life? Have you lived in a place where big weaponry was routinely displayed on ordinary days? If so, did it make you feel more or less safe? Did you see it as a sign of progress or of decline? 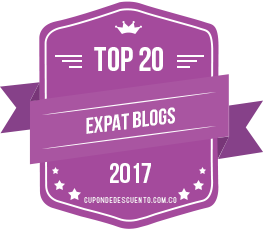 This entry was posted in Daily Life, Politics and tagged adventure, barranquilla, cnn, Colombia, expat, gun control, guns, juan valdez, Latin America, newtown, nra, politics, sandy hook, south america. Bookmark the permalink. I lived the first eleven years of my life in Nicaragua during most of the 80s so I’m sort of immune to guns in general, however, I did get a bit of a shock the first time I went to Colombia. We were traveling from Bogotá to Bucaramanga by bus, and halfway to our destination the bus had to stop by a “retén” of military police. They were carrying their “big guns” and asked everyone out of the bus. They asked us men to put our hands against the bus and patted us down. Fortunately for me, they only asked the women for the cédula (or passport), and not the men, or else I’ve would have been in big trouble since I was not carrying my passport. I did feel very safe, however, since these types of checkpoints are there to protect the people of Colombia and tourists alike. There was a time in Colombia when the FARC would kidnap and entire bus without anyone knowing about it. I understand your point of view. Your entire post was very thoughtful and well spoken. The fact is though, that the rogue attacks themselves are the sign that something has been lost. I believe that if we all chose not to provide the means for protecting against these attacks, whether through arming teachers or providing officers, that we would be in a borderline state of denial. The attacks happen from time to time. We should protect against it. Listen, I served six years on active duty in both Iraq and Afganistan. The principle alone did something more heroic than anyone I know has ever done. I was in combat. I saw bravery. Hearing what that woman tried to do made me tear up. I have a six year old daughter and I still can’t tell her about Newtown. I don’t want her to be scared at school. I wish that principle had a weapon that day. We would have one more Hero still alive in the world, who would probably have saved many of those babies. I’m not trying to debate, but surely you can appreciate my point. I look forward to more of your posts. Fred, thank you so much for your very thoughtful comment. It’s rare these days that we are able to have a thoughtful dialogue on such tough issues, but I think it’s so necessary if we are to find solutions. I do appreciate your point that the rogue attacks themselves are a sign that something has been lost. I have to agree. In terms of long-term solutions, perhaps the “what” was lost is at the heart of the matter. I am beginning to think more and more that people in the United States (and I’m sure in other places as well, but it is the U.S. that I know best) have lost a sense of community and connectedness that we once had. I don’t know if that’s at the heart of the terrible tragedies that we’ve seen recently, but I think it plays a part. I also think it’s part of the reason why our policymakers and our policy-making system seem to be failing us — how can we come up with solutions to tough problems if we cannot even discuss them civilly? It’s a vicious cycle of sorts. Over the long-term, I think we will have to find ways to build community and to respect individual freedom while not promoting individualism to a degree that creates isolation. As individuals, I would argue that it’s in our individual best interests to make a free choice to be part of building and growing and improving the community around us. In the short term, we have to figure out how to staunch the bloodshed as a result of this loss. I think that’s where the gun control debate really comes into play. I very much respect your wish that that brave Sandy Hook principal had been armed. I really do. And it’s hard for me to disagree with that wish, because it could have made all the difference in the world. But when I think about that day, I can’t help but wish even more that the shooter, Lanza, had simply never had access to a weapon in the first place. I can’t help but think of the news story about the mentally ill person who tried to kill schoolkids in China on the same day but who only had a knife. Though people were hurt, my understanding is that no one died. If I have to pick between my wishes — wishing the principal had had a gun or that Lanza had never had one in the first place — I have to choose the latter. And so I guess when I think about solutions, it’s the latter ideal world — the one in which the crazy shooter never had access to that weapon — that I want as the goal. I still hold out hope that our policymakers will take some common sense measures to keep guns out of the hands of those who would misuse them. Thank you again for your thoughtful reply. I am in the owner of a small guest house in Palomino Beach. The lifestyle there is idyllic and relaxing. A few days ago I received a warning about a group of people who had wandered into town. The warning went along the lines that the people were professional criminals who lived from their criminal activities. As surely as sunrise follows sunset, a day later my neighbor called me in to their house to show me what they had recorded on their security camera. A hooded male climbed over the fence surrounding my guest house and disappeared inside. There was no sign on the camera recording to suggest that he had left. My first concern is always going to be for my wife and my small family. I am left wondering should I buy a gun to defend my house or spend my money on an armed security guard to keep this type of people out of my house. The other option is to install razor wire and evil looking intruder deterrents all on my fencing. This is not the image I wish to project but I know that wishing these people away will not help the situation. What would you and your readers do under these circumstances ?